Released through: Legacy / Sony. Release date: Available now. So when Judas Priest wrapped up their lengthy ‘Epitaph’ world tour in May 2012, they chose to do so at London’s (England) Hammersmith Odeon, sorry, Apollo as it switched to a number of years back now sadly, although those of us that remember going to the old ‘Hammy Odeon’ mostly through the 80’s will always consider it as such! With Richie Faulkner now in the lineup in place of JP legend KK Downing, joining Rob Halford, Glenn Tipton, Ian Hill and Scott Travis, they’ve done well by the masses that came out to see them in 2011 / 2012. 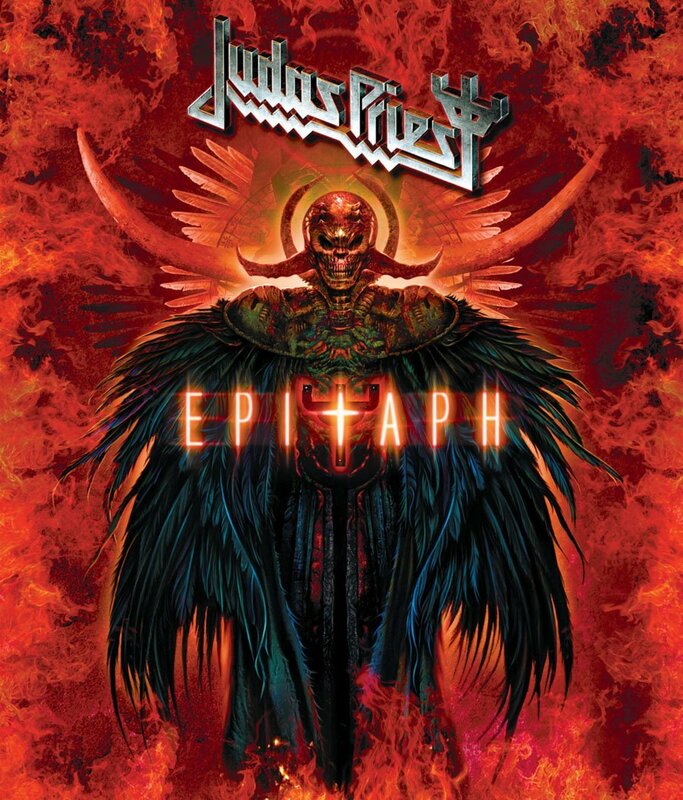 The opening intro for the show, is ‘Battle Hymn’ from Priest’s ‘Painkiller’ album, which then roars into ‘Rapid Fire,’ which is a killer opener for JP in anyone’s book! Phenomenal lighting and ‘new’ boy Richie Faulkner shows his ‘metal’ – cough, cough … sorry! – with some great lead work alongside Glenn Tipton. Rob fronts it all so well, what a vocal range! Flames burst from the stage and the ‘British Steel’ album cover appears on the screen behind the band introduces ‘Metal Gods,’ which just sounds so full. You know, I’ve been fortunate enough to witness ‘The Priest’ twice live in the past four years, once on the anniversary tour for ‘British Steel’ back in 2009 with KK Downing and then in 2011 on the ‘Epitaph’ tour, both here in the Detroit area and live they are still such a great live act. Rob then introduces the next song with ‘Is everybody ready for some Judas Priest Heavy Metal?’ Cue ‘Heading Out To The Highway’ which brings on a huge Hammersmith roar from this London crowd, who also do an excellent job echoing Rob on each chorus, great! Really love the band when the harmony lead break kicks in, albeit too brief. I will add at this point that there definitely appears to be a much better rapport / interaction between the old band members and Richie Faulkner, than how it seemed back in November 2011. Good to see, although they are saying this was their final, full scale world tour as Priest. Hmmm, I wonder just what that really means, if anything? ‘Judas Rising’ from ‘Angel of Retribution’ is next and it’s funny as the band had all appeared to have left the stage at the end of the last song, then they all come back out as the actual intro tape for ‘Judas Rising’ acts as a lead in for the band. Just seems a little odd as this DVD is taken from a one night show at Hammy Odeon, sorry … Apollo. ‘Starbreaker’ next is introduced by Rob as, ‘This one is from ‘Sin after Sin.’The crowd is more than happy to sing the ‘Starbreaker’ chorus line. Glenn encourages them by cupping his hand behind his ear. The harmony guitars again come into play on this song briefly and it’s all great, I love it! Glenn Tipton seems to smile from ear to ear throughout, much happier looking ‘chappie’ than he looked when they played here in Detroit last time out. Richie and Glenn take the front of stage position to lead the band into ‘Victim of Changes,’ which as all Priest fans know, has a fine harmony intro indeed! Faulkner is sporting a ‘Flying V’ guitar - Favoured of course by former Priest legend KK Downing - after having started out the show with a black Gibson Les Paul, totally looks more than fitting in Priest. Glenn Tipton takes a bit of a solo moment here with all but drummer Scott Travis having left the stage for a minute or so and then Richie Faulkner impresses with some truly stunning lead work, to which the crowd praise him up for. Scott Travis and Ian Hill remain solid to a fault, as the backbone and rhythm section for the band throughout. Rob then introduces ‘Never Satisfied’ as, “a song from ‘Rocka Rolla’ with some brilliant riffs!”It’s certainly one of those oldies but goodies style tune. What was great about the ‘Epitaph’ tour was Rob’s little history lesson given before pretty much every song in the set and next tune, the Joan Baez classic, ‘Diamonds and Rust,’ made even more so by Priest is no exception, as he tells the crowd that “this is our latest interpretation of her beautiful song, ‘Diamonds and Rust,” that is a tune that’s starts out gently and then really rocks out, as anyone would expect of a Priest tune, right?! That said, it does seem rushed in Rob's vocal delivery, once they do start rocking it out. As the song really gets into its groove, flames appear all over the back video screen to add to the massive finale of the song. The band all leave the stage once more, as backing tapes start rolling – Unless there’s a keyboards guy behind the curtain? – and then impressive lighting brings the band back out for ‘Prophecy’ with Rob cloaked in a golden hooded cape and clutching a Neptune like trident. One of the things that has always got me about Rob, is that he never seems to make any real eye contact with the crowd, with his head always looking down at the stage or side to side of the stage, as he ‘stalks’ around the stage area. I’ve never really understood that and I’ve never heard it discussed in any interview with him either? Of course he’s doing exactly this throughout the song ‘Prophecy.’It’s also very obvious the prominent keyboards evident throughout the song. I guess the album did feature Don Airey (Rainbow, Ozzy, Deep Purple) on keyboards, so how did they cover the keyboards here .., pre-recorded backing tracks ...? Another old favourite these days is ‘Turbo Lover,’ which I can remember back in the day, Priest fans questioning the bands use of synths at the time. That seems to be a minor detail today, as this track goes down a storm with the London crowd, with the ‘Hammersmith choir’ taking over singing the chorus. So all the band except Rob Halford take another walk from the stage, who remains to talk some about the ‘Stained Glass’ album and what “a huge ballad ‘Beyond the Realms of Death’ is” next. It’s always been such a monster, monster track in my mind and once more Richie Faulkner as the new guy deserves much praise for some great guitar work, but for me the icing on the cake is Glenn’s killer solo. Glenn and Richie walk out first again and tease the crowd – as they are roaring … - that they can’t hear them! This leads to their joint introduction to ‘The Sentinel’ and then the band all return and how Rob sustains his voice as long as he does always astounds me still. Love the guitar duel between both Richie and Glenn, brilliant! ‘Blood Red Skies’ is a killer song up next and again, those keyboards are very, very obvious and it’s yet another crowd pleaser! Rob does a little more crowd chat, saying that “as the stage has turned green, that can only mean one thing, it’s the ‘Green Manalishi (With the Two Pronged Crown’” and the band proceed to rip through their version of the Peter Green era Fleetwood Mac classic. Then its sing-a-long time for the crowd as Rob leads the crowd into, “’Breaking the what?’ BREAKING THE WHAT? !’ ‘Breaking the Law’” and he lets the crowd sing the entire lead vocal for the massive hit song. Brilliant! Scott Travis gets a brief drum solo spot, which then leads into ‘Painkiller.’ It's monster double bass drum time here and another monster solo from Glenn and likewise, Richie's solo in the song isn't too shabby either! Once again the band all depart the stage, only to return soon after for the double barrelled assault of 'The Hellion / Electric Eye.' Killer stuff! Amazing that Rob can sing the track while sitting astride the monster bike, but he does and the crowd helps once again with each chorus of the song. The clearing the stage after each or every other song continues and when Rob comes back next he asks the crowd to make as much noise as possible for the Judas Priest crew that is behind the band to put on show. Of course the audience duly obliges! Rob works the crowd some more having them sing every second line of the first verse and it's great stuff. 'Living After Midnight' is the evening closer, to wrap up an impressive set once again for Judas Priest in front of final audience of the 'Epitaph' tour. It's a very good DVD concert, although surprised there are no bonus features here. You'd think if they're saying it's the final full scale world tour, that they'd be some interview footage or something from behind the scenes, but alas no. Still, I enjoyed it, Priest fans will no doubt love it too!